The two color version of this porcelain dish can be used for food, or hung on the wall. It measures 8 inches in diameter and the glazes are food safe. It is also available in single color versions, for $35. I made little tiny stamps with my designs on them, and then cast the complete pattern in plaster, and painted the colors by hand. 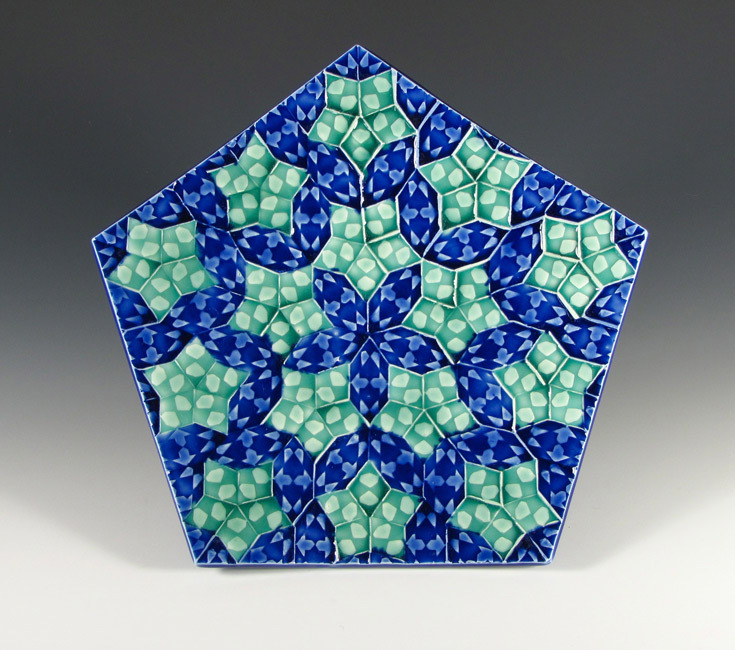 The patterns are based on a 700 year old tiling system invented during the Timurid era in Central Asia. It describes five specific shapes, within which I have created my own designs. Modern mathematicians have only just recently figured out how to describe these patterns, which are called quasi-crystalline pentagonal tilings. The system allows ten fold symmetry, and there are infinite possibilities available using the five basic shapes. To learn more about the mathematics behind this pattern, check out this article in Saudi Aramco World. This pattern is also available here, in single colors, for $35. You can use either your credit card or Paypal from the above links. If you are ordering multiple items, shipping charges increase automatically. Rest assured I will refund all excess shipping charges, you can expect $15-$25 total shipping on multi item orders. If you need help, or can't use the buttons, e-mail me at shimari@comcast.net .